Anyway, last April Fools Day I got a call from a user saying there was a problem with their laptop. They weren’t very concerned about the laptop because this one was scheduled to be retired April 4th (that’d be the next business day, Monday), but the new laptop needs files from the hard drive in the current one. The user was attempting to back up the files when something went wrong and called me. Right now I’m feeling pretty good. I’m not feeling so good anymore. So I now realize that this is the reason I say “almost no chance”, and my stomach starts to sink. I’m pretty sure the HDD’s toasted, literally, and this guy’s not going to get any of his files back (which could be a big problem later). But then, I remember that it’s April 1st – this has got to be a joke. One day away from retirement? Laptop up in flames? This guy’s pulling my leg. USER: “Heh. No, it’s not a joke. Are you sure there’s nothing we can do about my files?” (These client’s loved their files). 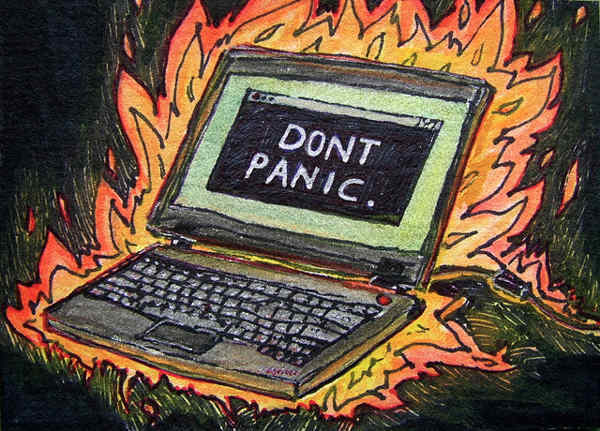 Also, I was shocked to see that we had a knowledge-base doc titled “Laptop on fire.” Apparently this wasn’t the first time this had happened. Previous articleNot the same thing.